If you arrive at Kazan Passagirskaya railway station, use the station map of the centre of Kazan . It takes about 30 minutes to walk from the railway station to the university. Alternatively, you can take a bus (numbers 10, 10A, 30, 63 or 91) or trolleybus (number 7). Leave the bus at Ploschad Tukaya (Tukay Square) or (University) metro stations. Look for two high buildings (the first and second buildings of the university), then use the maps of the university and the city centre . If you arrive at Vosstanie Passagirskaya railway station, use the metro. The nearest metro station, Severny Vokzal (North), is close to the railway station . Leave the metro at Ploschad Tukaya (Tukay Square) station. Look for two high buildings (the first and second buildings of the university), then use the maps of the university and the city centre . If you arrive at the airport, taxis are available. Taksi Tatarstan taxis (tel. +7 843 567 1567) charge about 600 roubles (£7.60) from the airport to the city centre and have many cars at the airport. There are also official taxi counters within the airport, which charge about 1,000 roubles for the same journey. There is an express train from the airport to Kazan Passagirskaya railway station, the cost is about 200 roubles. Please do not accept a ride with unofficial taxi drivers in Kazan as it can be dangerous. 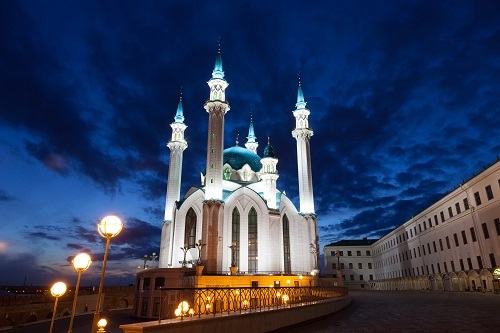 Kazan is the capital of the Republic of Tatarstan and one of the largest and most beautiful cities in Russia. One of its architectural gems is the Kazan Kremlin, a Unesco World Heritage Site. There is a greater mix of nationalities and world religions in the population of Kazan today than is found in many other Russian cities. Over its 1,000-year history, the city has achieved inter-ethnic harmony. About 1.2 million people – representing more than 100 nationalities – live in Kazan creating an atmosphere of cultural, religious and linguistic diversity. 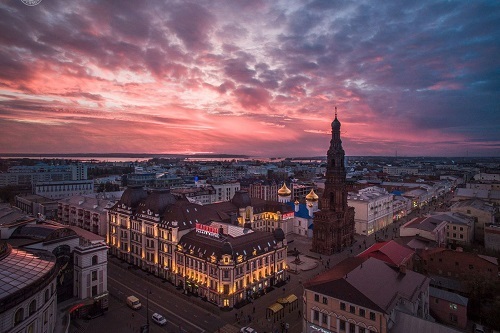 Kazan has always played a prominent role in Russian history. During the Middle Ages, it was a grand duchy of the Mongol Golden Horde which ruled much of Central Asia and constantly laid siege to cities in European Russia. In 1552, Ivan the Terrible declared war on Kazan and during his siege of the city it was almost entirely burned to the ground. Kazan’s destruction marked the last days of the “Tatar Yoke” and the city became part of Ivan the Terrible’s new Russian empire. In 1612, during the Time of Troubles, Kazan declared independence from Russia, but the move was brutally crushed by the army of Minin (whose statue is located in front of Moscow’s St Basil’s Cathedral). It was not until the reign of Catherine the Great that the city finally had lasting peace and a resurgence of Tatar culture as the Empress decreed that Tatars should be allowed to build Muslim places of worship and other buildings intended to nurture Tatar traditions. During Soviet times, Tatarstan remained an autonomous republic of the USSR and, in 1990, when the Russian Federation was formed, Tatarstan became a Russian republic complete with its own government and constitution.